Formula F4 is the perfect introduction for ambitious youngsters and players who want to change to rubbers with inbuilt speed glue effect. For those who seek clever placement and variation in their play and not just brute force, DONIC is the right choice. Our rubber provides an introduction to the fascination of FORMULA DONIC (inbuilt speed glue effect) - for the improving ambitious player. The soft sponge, with slightly reduced speed glue effect, combines the control of classic rubbers with the dynamic of the modern generation of rubbers. For all those who take advantage of their chances, and that at an astonishingly fair price. 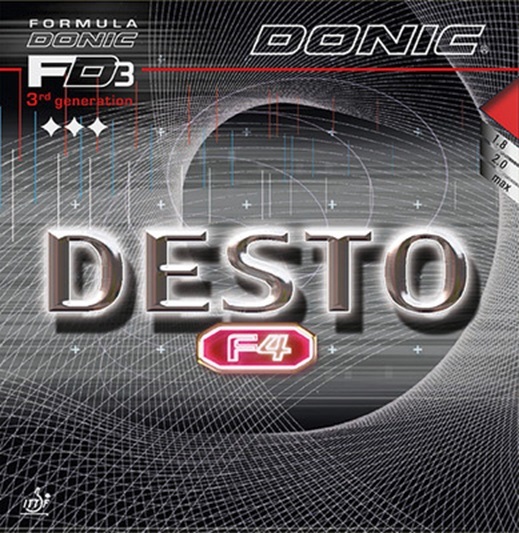 Desto F4, made in Germany.